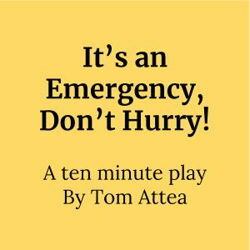 New Work It's an Emergency, Don't Hurry! Jim is a young businessman in demand. He has appointments here, there and everywhere, but he has one fundamental problem: he has lost his memory. Every detail about his life was kept in his electronic organizer but the battery (and the backup battery) has died, and now Jim is left floundering. In this comedic take on our modern reliance on technology, Jim seeks medical intervention to help him regain his memory.